Hola! It’s been awhile. The 2013 field season is in full swing, as evidenced by my not having posted since, um, FEBRUARY! No worries – I have a lot of sightings to fill this thing up with over the winter. 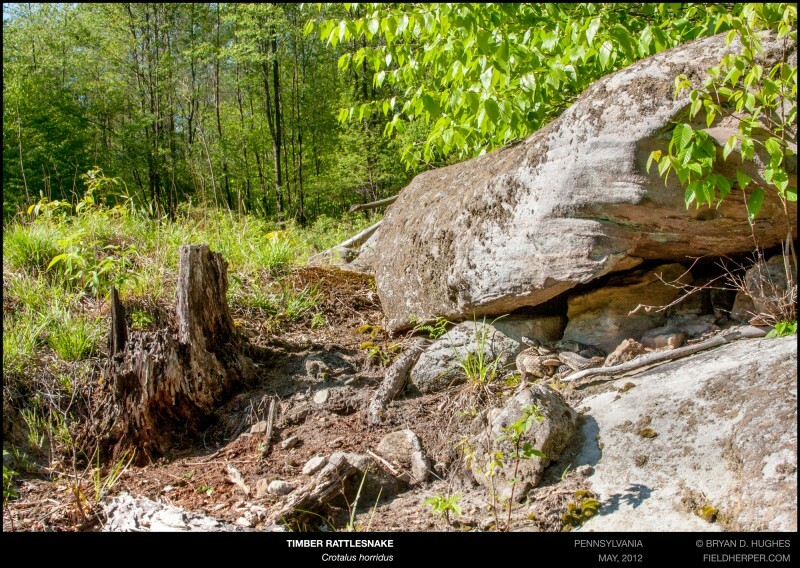 To start, here’s one of a timber rattlesnake we saw out in the cool spring air in 2012. This is the type of shot I am trying to get more of; I’ve been lucky to take lots of photos of snakes up close, sitting, defensive, sleeping, in ambush, you name it. As someone with great interest in these animals’ natural history, photos like this tell much more of the story. Where, what, how … the context can be as interesting as the animal itself. This entry was posted on Tuesday, August 20th, 2013 at 8:17 pm	and is filed under Field Herping, Personal, Snakes. You can follow any responses to this entry through the RSS 2.0 feed. You can leave a response, or trackback from your own site. I hadn’t checked your site since, um, February, and happened to look today – 1 day after your post! Hope all is well! We are busy too! Nice shot! haha, great timing! The year has been very good, juuust got back from a long trip and saw a bunch. Time to get back on this thing. Hope things are going well.